Last week, DOT presented a plan to calm traffic on Morningside Avenue in Harlem [PDF] with a road diet and pedestrian islands. Community Board 10’s transportation committee, which has a track record of dithering on and opposing livable streets projects, asked DOT for more data. Tonight, the action shifts to adjacent Community Board 9, which also covers the project area and could be poised to pass a resolution in support of the project. “I wouldn’t want to predict how the board will vote,” CB 9 member and Friends of Morningside Park president Brad Taylor said. Earlier this month, DOT presented its plan to CB 9’s transportation committee. Although the committee lacked a quorum at that meeting and could not pass a resolution in support, Taylor said the proposal was received favorably and moved forward to the executive committee, which was supportive of a full board resolution. Tonight’s CB 9 meeting is at 6:30 p.m. at the Fortune Society, 630 Riverside Drive. If CB 9 passes a resolution in support of the Morningside Avenue traffic calming plan tonight, there will be greater pressure for CB 10 pass a resolution, as well. Activists have told Streetsblog that DOT is unlikely to move forward on the plan without community board support. The next CB 10 full board meeting is October 2; the next transportation committee meeting is scheduled for October 9. 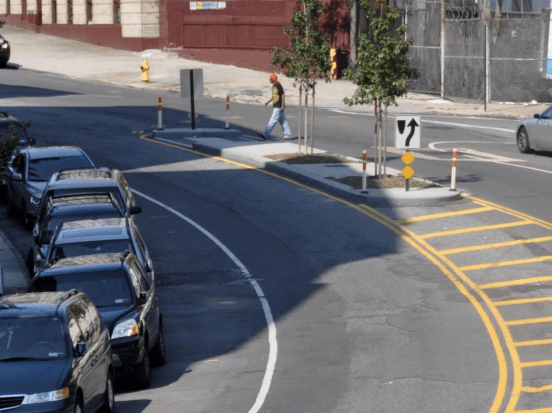 On Staten Island, a proposal championed by Transportation Alternatives [PDF] to bring bike lanes, crosswalks, and other traffic calming interventions to Clove Road between Richmond Terrace and the Staten Island Expressway passed CB 1’s Silver Lake/Sunnyside/Westerleigh area committee last night. Tonight, it heads to the full board, which meets at 8:00 p.m. at All Saints Episcopal Church, 2329 Victory Boulevard. “I am optimistic that the vote will be positive,” TA’s Meredith Sladek said, adding that CB 1 chair Leticia Remauro even suggested a protected on-street bike lane, which would be a first for Staten Island. The next step for TA activists, who have gathered a coalition of community groups in support [PDF], is getting the support of Council Member Debi Rose and DOT. Also tonight, DOT will update the Brooklyn CB 6 transportation committee on a design for a capital project [PDF] to bring pedestrian improvements to North Flatbush Avenue. The meeting starts at 6:30 p.m.
What happened at Manh CB 9 meeting? I couldn’t make it. why they tabled the plan? ?